After the success of last year’s event we were flattered and excited to be invited back. Graphic Arts has never had a better platform in the UK, if you’re after a concise summary of the scene then you can’t do any better than visit us at Somerset House for PMU 2011. This year Nobrow collaborated with CSM (MaCD) student Matthew Nicholson, who produced a series of giant cardboard objects related to the theme of our very latest issue Nobrow 5: A Few of our Favourite Things, representing: you guessed it, some of our favourite things! 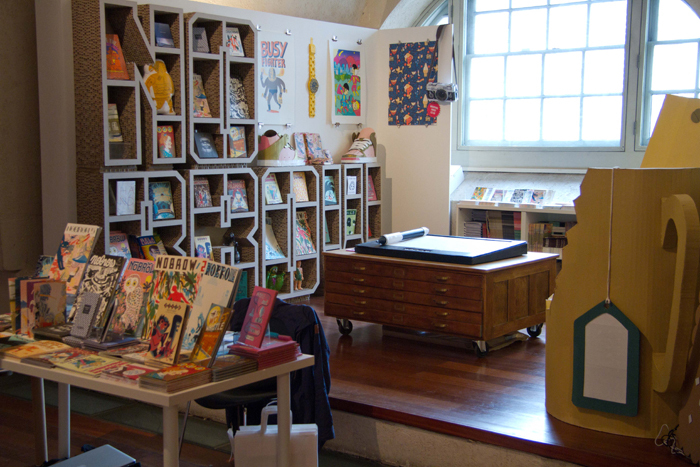 He was also responsible for designing the beautiful NOBROW bookcase which is featured in the space, created from over 25 immense sheets of 3 x 1.5 m heavy duty cardboard, which were laser cut and then stuck together to create the structure. We were also very pleased to see that a number of artists who we’ve worked with in the past were represented in the Rising Stars section of the exhibition, featuring work from Mcbess, Paul Blow, Gwénola Carrera and Eda Akultan and their work looked fantastic! The exhibition runs from Thurs 17th March to Sunday 27th March, 10 am to 7pm. Thursdays, late night opening until 9pm! Please visit the Pick Me Up website for more information.